David McKeon is joint CEO of Grain Growers Limited, a national grain farmer member organisation. David has extensive experience in farm management, agricultural policy and industry leadership. Prior to joining GrainGrowers, he led industry policy with the Rural Affairs portfolio at the National Farmers' Federation and previously played a key role within the Federal Department of Agriculture on a variety of national policy issues. Complementing his policy expertise, David has significant hands-on experience working on a number of mixed farming operations. 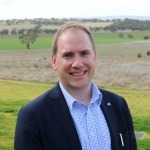 David holds a Bachelor of Applied Science (Agriculture) and Bachelor of Agribusiness from Charles Sturt University, together with a Diploma of Government and he is a graduate of the Australian Institute of Company Directors. David continues to drive outcomes for farmers through a number of industry leadership positions, including on National Farmers' Federation policy committees, Grain Trade Australia technical committees and the ACCC Agricultural Consultative Committee.